Sharing this article here with all of you, please read as it's very important!! Published October 29, 2012 by Thomas Kolb, M.D. "Recently the issue of a woman’s breast density became front-page news. So now seems to be a good time to clarify what the controversy is and to critically evaluate the degree to which patients should be educated by their physicians concerning their breast density. This past August, New York State became the fourth state to pass a Breast Density Inform Law. The legislation is simple enough. After a screening mammogram, radiologists must now—in addition to transmitting the result of her test to both the referring physician and the patient—also directly inform a patient of her breast density. Since density affects a mammogram’s accuracy, it is an independent risk factor for developing breast cancer and can be useful in guiding personal healthcare decisions. Therefore, it is important that women have this information. Still, certain insurance groups and medical organizations opposed the bill’s passage and continue to oppose its intent. How can this be? First, some facts: Having dense breasts, as opposed to predominantly non-dense breasts (also called predominantly fat-containing breasts), is determined by genetic and hormonal influences and is quite common. Sixty-six percent of premenopausal women and 25 percent of postmenopausal women have breasts dense enough to affect mammographic accuracy. Only a mammogram can determine density—not physical examination nor breast size nor texture. So, a woman would need a mammogram just to know her density. It has been almost 10 years since I published two studies analyzing 27,825 consecutive patient examinations and reported that mammograms were highly accurate in women with non-dense breasts, detecting 98 percent of cancers. However, as density increases, mammographic sensitivity decreases, and in women with the densest breasts, only 40 percent of cancers were detectable by mammography. In fact, of all the factors evaluated, breast density was the most statistically significant reason a mammogram would fail to detect cancer. Understanding this limitation, I performed a screening ultrasound on all women with dense breasts and diagnosed an additional 42 percent of women with cancer who would have been falsely labeled healthy by their mammogram. The false positive rate for ultrasound was only 5 percent, a percentage that I, and almost any woman you would ask, believe is an acceptable tradeoff for finding large numbers of otherwise undetected breast cancer. The AMA gave the study a Scientific Paper of the Year Award for 2002, and during the past 10 years, multiple investigators, including multi-institutional studies, have corroborated these findings. The medical community is fully aware of these findings, and now accepts all of them as fact. However, this knowledge has not been adequately transmitted to the general public. While the FDA has mandated via the Medical Quality Standards Act that radiologists directly transmit mammogram results to the patient, there is no necessity to report the degree of breast density. Therefore, when describing a mammogram result to a patient as “normal,” the radiologist may be only 40 percent accurate in his or her diagnosis. Yet the patient is never informed of her mammogram’s degree of accuracy, nor have patients been educated that breast density in itself is a significant risk factor for developing breast cancer. If a patient were to be informed, she could then be an educated participant in her own medical care and have opportunity to discuss with her doctor the advisability of additional screening, such as with ultrasound or MRI. This lack of disclosure to the patient has a direct impact upon her own health care decisions. Why would anyone oppose this bill? Well, there are four major reasons for dissent. Examining each reason brings appreciation as to why the bill is necessary. •The first reason for dissent is the fear of unnecessary additional testing and invasive procedures. There is concern about a lack of adequate validation (read: higher survival rates) of additional screening methods such as ultrasound and MRI. Some have suggested that these additional screens should not be performed until there has been a randomized, controlled trial proving a benefit. However, I would argue that while a randomized controlled trial is optimal, and ultimately the only way to prove that screening brings a survival benefit, it is somewhat disingenuous, and perhaps reckless, to suggest waiting. Because of their cost and complexity, randomized controlled trials will likely never be performed—and even if done, it would take 10 to 15 years for survival data to become available. Those who argue against using screening ultrasound, which is acknowledged to diagnose an additional 42 percent of cancers missed by mammography, know full well that randomized, controlled trials will not be performed any time soon, if at all. The question is, What can we do, or should we do, in the absence of randomized, controlled data? What we do know is that ultrasound finds these additional cancers at a small size and low stage similar to those cancers found by mammography, which has been proven to save lives. Utilizing ultrasound or MRI as a screening test requires the leap-of-reason that finding cancers early saves lives. True, not all lives will be saved with early detection, but since we do not know in advance which lives won’t be saved, should we abandon looking for those cancers that can save a woman’s life? Short of a randomized controlled trial, that is the best we can offer patients today. Shouldn’t patients know that? Simply put, we as physicians can find large numbers of early-stage, treatable cancers that mammography misses in women with dense breasts. Patients have a right to know this, and only then can they have a meaningful discussion with their physician as to whether additional screening is warranted. •The second reason for dissent is that it has been argued that no consistent definition of breast tissue exists and there is no clear scientific evidence that breast tissue alone is a factor for high risk of breast cancer. While evaluation of the degree of density based on mammographic appearance is subjective, the presence of dense vs. non-dense is not. Numerous rigorous scientific publications have used breast density categories to evaluate for cancer risk, and just about all have found a significantly elevated risk of cancer in women with dense breasts. To argue otherwise and characterize density evaluation as subjective, non-reproducible, and of no clinical concern is to fixate on the less important issue of quantifying density while ignoring the increased risk density confers. •Finally, everyone worries about cost: The New York State bill is about patient education. The insurance reimbursement provision for screening ultrasound in this bill was removed prior to the State Senate and Assembly vote. Legislators did not want to add any costs to our health system, although it is possible—and, according to many, likely—that finding breast cancer earlier may actually balance out costs or even save money in the long run. Compounding the controversy is the media’s misinterpreting of scientific studies and feeding misinformation to their readers. In August, a paper was published reporting that high mammographic density was not associated with increased death compared with lower density. Physicians and the media interpreted this as proof that there was no reason to pay any special attention to those with dense breasts; rather, they should be screened the same as those with non-dense breasts. Even the American College of Radiology touted this as good news for patients. However, careful analysis of the study shows that the non-dense group of women were mammographically screened less often than the dense group. If both groups had been screened equally, it is reasonable to expect that the women with non-dense breasts would live longer—which, when comparing the two groups, is another way of saying that the women with dense breasts would die sooner. Since this hypothesis was not evaluated in the study, one cannot make the argument that women with dense breasts should be screened in the same fashion as those with non-dense breasts. It is unfortunate that legislative measures have been enacted to compel doctors to transmit information to patients, since doctors (including me) never wish to have the legal system impose upon them how they should practice. However, in this instance, legislative efforts to inform patients is about welcoming patients into the decision making process when we as physicians have some—but not all—answers. At this point, only with information about their own bodies will women have a meaningful understanding upon which to base their breast health care decisions. Thomas Kolb, M.D. has been on the faculty of numerous medical educational meetings, and he has lectured throughout the U.S. and internationally on the topic of breast cancer detection and diagnosis, including at the New York Academy of Sciences and the Radiological Society of North America. In 1998, Dr. Kolb published the first contemporary study detailing the use of screening breast ultrasound to detect cancers, and in 2002 his publication describing the performance characteristics of mammography, clinical breast examination and ultrasound was awarded the Scientific Paper of the year by the American Medical Association. Dr. Kolb is currently a principal investigator of the North American Digital Breast Tomosynthesis project, which is analyzing a novel mammographic technology that acquires multiplanar images of the breasts." I never post my arts newsletter in this blog, but since it's Breast Cancer Awareness Month and there is information about the IN THE PINK exhibition I'm participating at, as well as a link to my Awareness Buttons, here it goes, hope you enjoy it! ...and if you're near by, don't miss the opening of IN THE PINK! Back at IN THE PINK! 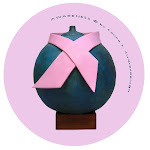 I'm very excited to share with you that, once again, I'll have my sculpture AWARENESS on display in an art exhibition to celebrate the National Breast Cancer Awareness Month. I love it when I can bring this piece out and spread the message around to those who get to see it! Yes, I entered Awareness into this juried exhibition and I was just informed it was selected in by the jury, to be part of this Breast Cancer Awareness Regional Art Exhibition at the Six Summit Gallery in Ivoryton, CT. The exhibition will run from October 5th through the 31st. It was juried by Six Summit Gallery, Sally Jessy Raphael -celebrity-former talk show host and artist at Six Summit Gallery, Jacqueline Hubbard- Executive Director of the Ivoryton Playhouse, Sonia Baghdady -an award-winning news anchor for News 8 (WTNH) in Connecticut, Nancy Whitcher -President of Connecticut Women's Artists, Erica Tannen -Publisher of the e-list, a weekly newsletter about good things on the CT Shoreline. Though my piece won't be for sale, for obvious reasons, portion of proceeds from the artwork for sale in the show will go to benefit the new Dana-Farber Cancer Center at Lawrence Memorial Hospital. My reaseach has never stopped! Continuing on my research to find a better option for women with Dense Breast Tissue, to find out whether they have cancer or not at an early stage, I came across this report by Wall Street Journal Health Columnist, Melinda Beck. Once again, we find how crucial it is for that 40% of the women population with dense breast tissue, to know her breast density, and to get better ways to be diagnosed in time! Mammograms miss 40% of breast cancers in women with dense breast tissue, and such women are four times more likely to develop breast cancer than others. A campaign dubbed "Are You Dense?" is gaining momentum, as Melinda Beck has details on Lunch Break. Photo: American College of Radiology. As always, we welcome your comments, and make sure to click on the tabs above for updated information, news and more! Stay safe! P.S. : Want to share your personal story here, just email at DBTAwareness[at]GMAIL[dot]COM Just remember to substitute [at] for the symbol @ and [dot] for an actual . (dot) Thanks! Awareness and the Healling Power of Art!! Renee Phillips (founder/director of the Manhattan Arts International, Author, Curator, "The Artrepreneur Coach") emailed me to let me know that she has posted the image of "Awareness" on the Manhattan Arts International website, as part of an Open Call for the 7th "Celebrate The Healing Power of Art" on-line exhibition. Thank you Renee! I loved participating in The Healing Power of ART exhibition two years ago, and will do it again (if I get in) this year. The purpose of this exhibition is not only to promote art and all aspects of creativity, but its vital importance to healing individuals and the planet. They seek for Art that is uplifting, powerful and transformative, as they believe that Artists that create healing art not only experience the healing process for themselves, their art has a healing impact on the viewers, and the earth. Artists, submission starts on February 1st! It is a wonderful exhibition to be part of, so if you're an artist, don't miss the chance to heal someone through your art!!! Remember, every time to stop by, to check the above tabs as well, as I post information and latest news as they come my way, so you don't miss a thing! Here's a link to the latest info found, but you will find it permanently on the FOR YOUR INFO tab as well. Happy and Healthy New Year to all, and remember, the best medicine is PREVENTION so stay inform and be proactive!!! I created this sculpture, "Awareness", to bring healing to the people that see it, and to inspire women to take a more proactive approach to stay healthy. For this, I have shown it in several venues in the U.S., around Connecticut and in NYC, and it’s been viewed internationally through web-based galleries. Well, I want to donate it, and in my research came across the issue of Dense Breast Tissue and how the current technology misses 40-50% cancer on this type of tissue, amongst other things. Therefore, since we cannot achieve anything alone, I created this blog as a mean to join forces with other women out there (and men too) that are as concern as me with the tissue issue, in order to demand a better technology to early diagnose breast cancer in women with Dense Breast Tissue! We need to raise our voices to be heard! ...and I'll be happy to post it here. Please, make this blog yours as we cannot achieve anything alone... thank you in advance for FOLLOWING us! United we can save lives, our lives! 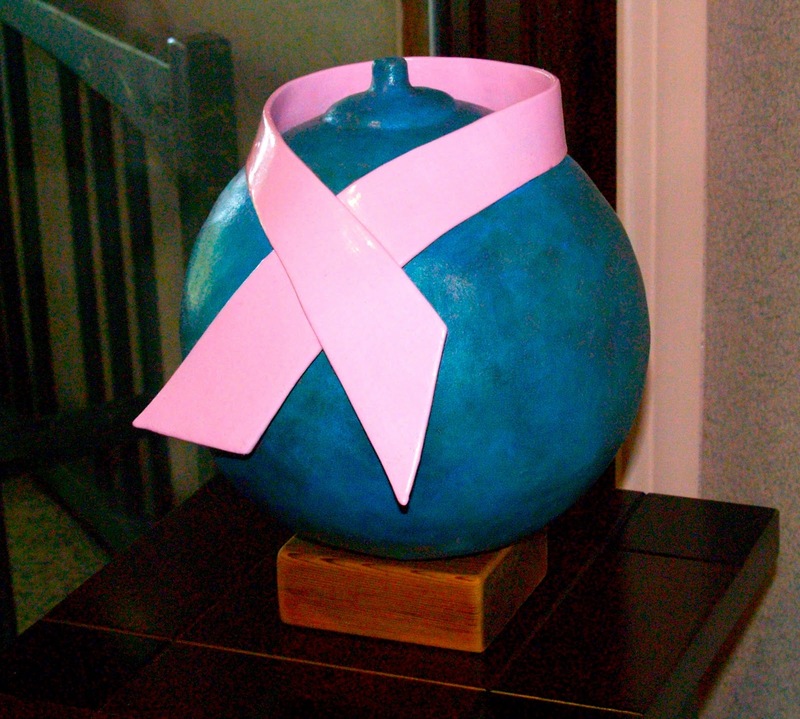 Looking to donate my sculpture "Awareness" and in my research came across the issue of Dense Breast Tissue and how the current technology misses 40-50% cancer on this type of tissue, amongst other things. Therefore, since we cannot achieve anything alone, I created this blog as a mean to join forces with other women out there (and men too) that are as concern as me with the tissue issue, in order to demand a better technology to early diagnose breast cancer in women with Dense Breast Tissue! We need to raise our voices to be heard! United we can save lives, our lives! All images of the artworks in this blog are ©1983-2012 by the artist, Corina S. Alvarezdelugo. Simple theme. Powered by Blogger.